In a large bowl, cream butter and sugar until light and fluffy. Beat in egg and vanilla. 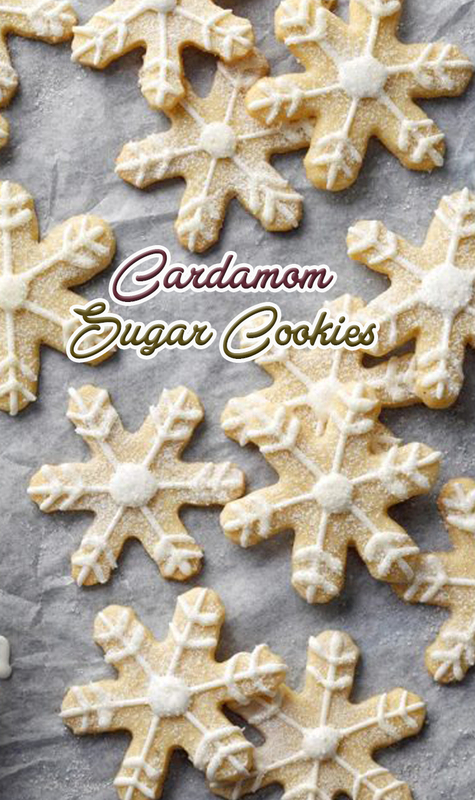 Combine the flour, cardamom, salt and nutmeg; gradually add to creamed mixture and mix well. Divide dough in half. Shape each portion into a ball, then flatten into a disk. Wrap in plastic and refrigerate for at least 3 hours. Roll each disk directly on parchment to 1/8-in. thickness. Cut with a floured 2-1/2-in. snowflake-shaped cookie cutter, leaving at least 2 in. between cookies. Remove trimmings; repeat with remaining dough, refrigerating dough as needed. Place parchment with cookies on baking sheets. Bake at 325° until edges are lightly browned, 12 to 15 minutes. Cool for 5 minutes before removing from pans to wire racks to cool completely. In a small bowl, combine confectioners’ sugar and milk. Pipe over cookies and sprinkle with coarse sugar and/or glitter. Let dry completely.